I am a sucker for sweet and fruity scents so the moment I smelled this candle, I smiled. My nose could detect all the ingredients listed in the name. Sweet peach, tart orange and succulent mango all blended to perfection. That sounds lovely. When I smelled the wax for the first time, it indeed smelled like sweet and delicate peaches with sweet oranges and mango blended in. I loved it the moment I smelled it. I started this candle in a small bathroom because I had a feeling the fragrance would be on the lighter side. When I think that’s the case, burning in a smaller space is always better to achieve maximum scent throw. With this candle… I was totally right. Once I lit the wick, it took a good hour to achieve a decent melt pool and once it did – the fragrance traveled all through my small bathroom but it was pretty subtle. I could smell the fragrance when I walked into the room but it wasn’t very strong at all… just a really soft and subtle fruity scent. The fragrance…sweet peaches and zesty orange. The mango kind of got lost once the candle was burning but the overall scent was still really fresh and fruity. I liked it. I just wish it would have been a tad stronger. Strength – on a scale of 1 to 10, I’d rate this a 4 in a small room. Anything bigger, the aroma would be lost. This candle had some good and bad moments. It burned really slow and never reached full melt pools with each lighting so there was a thick layer of wax left on the glass wall at the end. The wick struggled a lot and I’m not sure why. This was a nice and fresh fruity scent and I did enjoy it. My only wish would that it had been stronger. It was just a little too lightly scented for me. And even though this candle didn’t burn perfectly, I still utilized all the leftover wax by scooping it out and placing it in my electric melters. Nothing goes to waste in my house which I might add… the scent was much stronger melting. I love Bluewick and will definitely be reviewing more fragrances down the road so stay tuned. 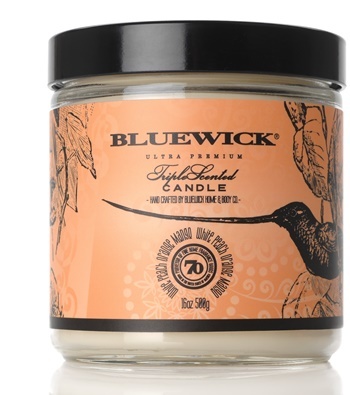 White Peach Orange Mango from Bluewick is quite the mouthful but if you love sweet and fruity scents... this is a must sniff.... it smells like sweet peaches and zesty oranges. A perfect and subtle candle to burn in a bathroom or smaller room.